In this paper we provide an overview of the fifth edition of the CLEF eHealth evaluation lab. CLEF eHealth 2017 continues our evaluation resource building efforts around the easing and support of patients, their next-of-kins, clinical staff, and health scientists in understanding, accessing, and authoring eHealth information in a multilingual setting. 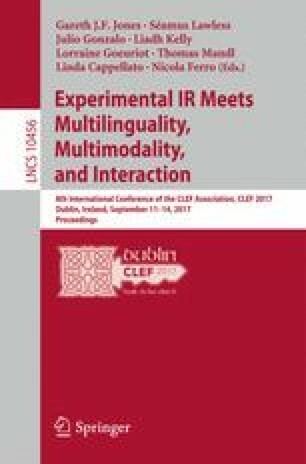 This year’s lab offered three tasks: Task 1 on multilingual information extraction to extend from last year’s task on French corpora, Task 2 on technologically assisted reviews in empirical medicine as a new pilot task, and Task 3 on patient-centered information retrieval (IR) building on the 2013-16 IR tasks. In total 32 teams took part in these tasks (11 in Task 1, 14 in Task 2, and 7 in Task 3). We also continued the replication track from 2016. Herein, we describe the resources created for these tasks, evaluation methodology adopted and provide a brief summary of participants of this year’s challenges and results obtained. As in previous years, the organizers have made data and tools associated with the lab tasks available for future research and development. G. Zuccon—In alphabetical order by surname, LG, LK & HS co-chaired the lab. AN & AR, EK & RS, and JP & GZ led Tasks 1–3, respectively. The CLEF eHealth 2017 evaluation lab has been supported in part by (in alphabetical order) the ANR, the French National Research Agency, under grant CABeRneT ANR-13-JS02-0009-01, the CLEF Initiative and Data61. We are also thankful to the people involved in the annotation, query creation, and relevance assessment exercise. Last but not least, we gratefully acknowledge the participating teams’ hard work. We thank them for their submissions and interest in the lab.